Jeriel Bey founded Architeckz in 2002. 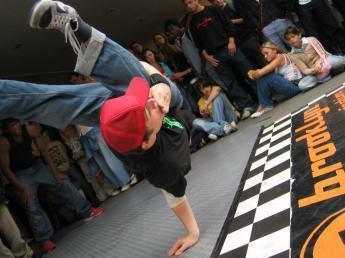 It’s a Hip Hop Freestylin’ group with participants aged 8 to 22. Most come from bad neighborhoods and teeter on the edge of trouble. Architeckz keeps them on the right track. Architeckz roots come from Oakland, California where people come together just to show off their hip hop style. Architeckz isn’t just a dance crew. They consider themselves an athletic team. And, they want to bring their sport to the world. Bey organized a competition at a local college last May between Architeckz and another street dance crew from Los Angeles, the Remanece. Bey hopes this is the first of many competitions. He has feelers out for competitions throughout the US. Bey has been involved with the issues of obesity, health, and attitude among youth in inner cities. He sees freestylin’ as more than dance. He sees it as a way to teach kids health and fitness. Street dancing appeals to many kids because the emphasis is on personal expression and style, rather than performing a certain move in a certain way. So, why not get schools and other organization involved in promoting freestylin’ as a form of athletics since kids already enjoy it? With the help of the local YMCA, Bey has programs going at Brett Harte Middle School and Rudsdale Academy in California. Bey hopes to channel the positive energy of Hip Hop into something that will transform lives.